Today, a national study on DUI arrests was released by Project Know,a drug addiction resource center that combats substance addiction and the societal issues that stem from it. In it, they sifted through data from federal agencies to figure out where you are most likely to get arrested for a DUI, per capita. For example, Seattle had 2,861 DUI incidents in 2013, which puts its DUI arrest rate at 43.8 per 10,000 residents—slightly lower than Washington’s 2013 rate of 49.8. There were more DUIs in Seattle in 2013 than in 2012 or 2011 and, so far this year (up to November 16th), there have been 2,588, which should put the end-of-year total at about the same level as 2013’s. My opinion? Interesting projections. Let’s see data showing the lobbying efforts and financial contributions of different anti-drinking-&-driving groups like Mothers Against Drunk Driving (MADD) . I wonder if their efforts have anything to do with the projections and proactive enforcement of DUI laws in Washington? Just a thought. The Washington Post reported that recent technological breakthroughs could virtually eliminate DUI’s which kill thousands of Americans each year. The technology could begin appearing in cars in five years. Unlike ignition interlock devices, the new equipment won’t require a driver to blow into a tube. Instead, either a passive set of breath sensors or touch-sensitive contact points on a starter button or gear shift would immediately register the level of alcohol in the bloodstream. Drivers testing above the legal limit wouldn’t be able to start the car. “The message today is “Can we do this?” but “How soon can we do this?” said Mark Rosekind, administrator of the National Highway Traffic Safety Administration (NHTSA). Though no cost-per-car estimate has been made, once the sensors go into general production it’s anticipated the cost will be equal to that of seat belts or air bags, about $150-$200 per vehicle. The article said that the goal is to produce a device that will react in less than a second and function without maintenance for at least 10 years or 157,000 miles. Sensors that detect alcohol levels in the air can react in less than a second after a driver gets into the vehicle. The technology is an offshoot of advances in sensory detection since the Sept. 11, 2001, terrorist attacks. With sudden demand for bomb detection sensors, the ability of machines to scan people, packages and luggage for tiny trace elements has expanded exponentially. The American Beverage Institute, a restaurant trade association, opposes the alcohol detection system. Data from the NHTSA shows that in 2013, 10,076 people were killed in car crashes involving drunk drivers. That was less than half the number of alcohol-related traffic deaths recorded in 1982, when 21,113 people were killed. In the past 30 years, 401,404 people have died in drunken-driving crashes. My opinion? It’ll be interesting to see how various lobby groups fight or support this new technology. Believe it or not, many U.S. States have banned Happy Hours. A recent article from http:www.cityab.com reviewed the 25 biggest metropolises in the U.S. to map where you can grab a cheap post-work brew and where you can’t. Some information is provided in the photo above. According to CityLab, the reason why the laws are so different in many cities is because many bans were implemented in the 1980s when citizen groups led by Mothers Against Drunk Driving teamed up with the National Highway Traffic Safety Administration (NHTSA) and presented state legislatures with Statistical Analysis of Alcohol-Related Driving Trends from 1982-2005. The statistics show that in 1982, for instance, more than half of the country’s fatal crashes involved at least one driver with a blood alcohol level of .08—the legal limit. Additionally, in 1984, the same year Massachusetts passed its anti-happy hour law, President Ronald Reagan declared the first National Drunk and Drugged Driving Awareness Week, and Congress passed the National Minimum Drinking Age Act, which effectively set the federal drinking age to 21. These stories share a common truth: basically, the variability in cities’ happy hour laws can be chalked up to local politics and general sentiments about drinking. The “No Happy Hour Restrictions” states are marked in green. Cities include Denver Colorado, Washington D.C. and Jacksonville, Florida. The “Happy Hour Restricted” states are marked in red. They include Boston, Minneapolis and Charlotte, South Carolina. Some interesting states bear mention. 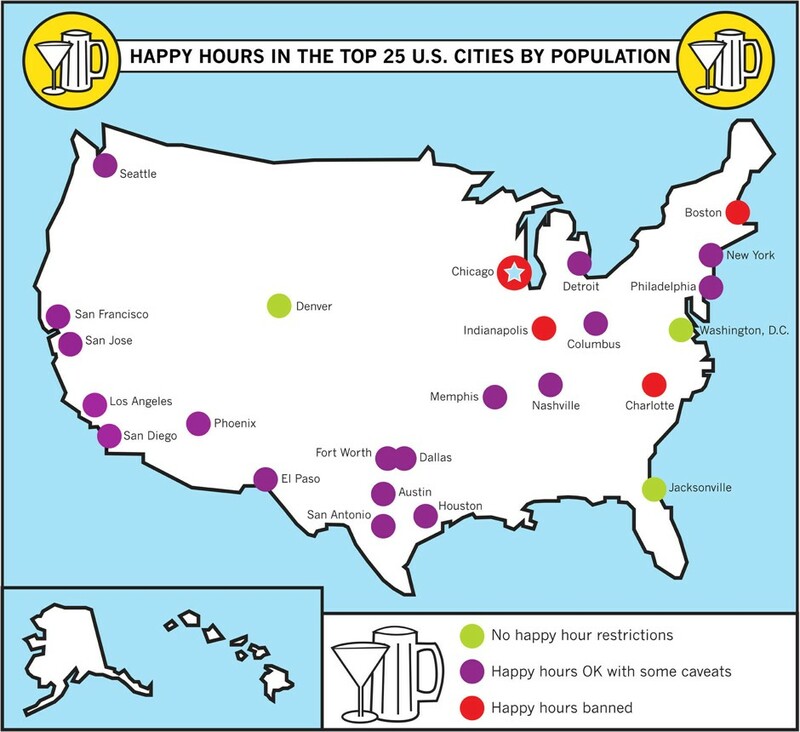 Purple states allow happy hours to happen, but with restrictions: they can only take place at certain times of day, at certain price levels, and in certain quantities. In Austin, for instance, purveyors are compelled to close up happy hour shop at 11 p.m. California establishments can’t sell two drinks for the price of one. In New York, bars can’t offer beers at less than half their normal price. In Pennsylvania, you can only have two hours of happiness per day, and not between midnight and closing time. Interesting. Here, defendant Robert Barry went to jury trial facing two counts of Child Molestation in the First Degree. He did not testify. After the parties rested their cases, the jury deliberated. During deliberations, the jury asked the court whether it may consider “observations of the defendant’s actions-demeanor during the court case” as “evidence.” In response, the trial court instructed the jury that “evidence includes what you witness in the courtroom.” The court record, however, contained no references whatsoever to Barry’s in-court demeanor. The jury convicted Barry of both counts of child molestation. He appealed, claiming that the trial court’s instruction in response to a jury question violated his Fifth Amendment and Sixth Amendment rights under the United States Constitution. The WA Supreme Court reasoned that the Fifth Amendment does not extend to the jury’s generic reference to “actions-demeanor,” and the Sixth Amendment does not transform all evidentiary errors into errors of constitutional magnitude. Consequently, no constitutional error occurred. With that, the WA Supreme Court upheld the trial court and found Mr. Barry guilty. My opinion? I agree with Justice Johnson’s dissent. Although there’s no record of Barry’s demeanor during trial, we do know that before trial began, the court advised Barry that he should refrain from any display of emotion. It advised that everyone in the courtroom remain stone-faced throughout the trial and that no one should show any reaction to the children’s testimony. The court explained to Barry that such a showing of emotion could ”backfire” on his case. Justice Johnson reasoned that assuming Barry complied with that instruction, his observable lack of remorse throughout trial likely prompted the question from the jury. After the defense has rested its case, and after closing arguments, the trial court cannot instruct that those observations may be treated as “evidence” bearing on the determination of guilt or innocence when the defendant has had no opportunity to challenge or explain that evidence. This is akin to allowing a prosecutor to argue evidence not presented at trial or allowing a witness to testify privately without cross-examination, to the jury during its deliberations. It deprives the defendant his right to confront the evidence, and at the very least, it deprives Barry an opportunity to challenge the propriety of the use of this “evidence” in the determination of guilt. Exactly. At best, this is a murky opinion. At worst, it violates the defendant’s rights at trial.